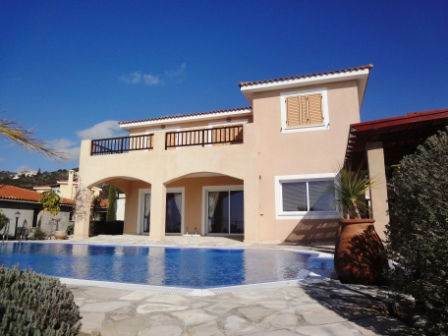 Tala, Paphos - This luxury 4 bedroom villa is located in Tala village, 10 minutes drive from Paphos Town and the International School. The village has a variety of local shops, together with a quaint village square with a range of restaurants and tavernas. At the front is an attractive courtyard garden with small steps to the driveway at the side. A wood finished central staircase in the entrance hallway leads up to the bedrooms and down to the spacious living area. The living area features a huge lounge with open fireplace and two sets of patio doors with lovely views of the pool terrace and beyond. In one corner is a guest cloakroom with a walk though area with built-in storage cupboards. An archway leads to an open-plan dining room and kitchen, the two areas are nicely separated by a breakfast bar. The kitchen is well equipped with granite worktops & all appliances. There is a separate laundry & storage room. Upstairs are 4 double bedrooms, all with fitted wardrobes and aluminum shutters - ideal for keeping the rooms cool in the summer. The master bedroom has an en-suite shower room with fitted units/mirror, floor to ceiling tiling, and double shower. The separate family bathroom also has similar finishes. Three of the four bedrooms have access via patio doors to a large balcony with fantastic, panoramic sea views. The views are also wonderful from the pool terrace and can be enjoyed whilst relaxing under the large covered terrace, swimming in the beautiful tiled pool, or chilling out in the shaded hot tub. At the side there is direct access to the kitchen and dining room, a fully tiled shower, and large storage room which houses the boiler for the central heating. The attractive landscaped gardens are terraced with the satellite dish installed on a lower terrace out of sight. This stunning property has many interesting features with much attention to detail. No expense has been spared with the design and quality of the finishes. Please refer to MLS #: 1257 when inquiring.